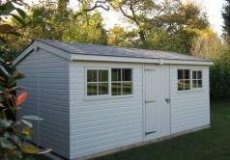 With over 40 years’ bespoke construction experience, we tailor garden buildings to our customers' needs. All design features have their own unique advantages. Which design options you choose rests entirely on what you want to use your garden building for. An apex roof has two slopes which meet in the middle of your roof, across the length of your garden building. A pent roof has a single slope, creating an incline. When choosing between the two, you should consider the building’s function, the layout of your garden and of course your desired style. In this article, we will guide you through the distinct benefits of both apex and pent roofs. How Do You Intend to Use Your Garden Building? We offer a range of designs for our Garden Sheds. They are ideal to use as storage solutions, but also as workshops and dedicated hobby rooms. Each intended use brings specific practical requirements, and with this an ideal choice of roof. Of course, the amount of time you spend inside your shed will vary based on how you intend to use it. This Superior Shed was built to be used as a workshop. We wanted to make sure the customer had enough headroom to use their shed regularly. An apex roof was the best choice to go for. The two slopes provide enough interior space to move about comfortably when working. In comparison, the sloping design on a pent roof creates one space in the shed with more headroom than the rest. This space is usually where the door is located. If you intend to use your shed for storage, a pent roof gives you enough space to go in and grab what you need. For your garden building to be both attractive and functional, it needs to match the size and layout of your garden. This Classic Shed fits nicely into the corner of the customer’s garden, up against their fencing. This is because they opted for a pent roof. A pent roof will make a garden building much more compact. This could be ideal depending on the size of your garden. If you have the space to have your garden building in the middle of your garden, an apex roof could look better. Another fantastic selling point for pent roofs is how the slope diverts rain and snow directly away from the timber. This minimises any possible water damage. It can also stop snow from piling up around your building in the winter months. You could also line your roof with our heavy duty felt, making it extra waterproof whether it’s an apex or a pent roof. a much more traditional design feature. 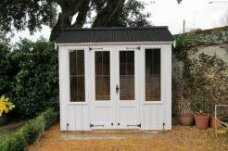 It works well for this Lavenham Summerhouse, from our range of National Trust Summerhouses. The apex roof is lined with black corrugated material. This lends the appearance of a small luxury cottage in the customer’s garden. This is accentuated by the cast iron door furniture and Georgian windows. So, if you want to capture the beauty of a bygone era, the apex roof is a mainstay of classic design. In comparison, a pent roof offers a sleek, modern appeal to your garden building. Take this Salthouse Studio, from our collection of Garden Studios and Offices. It has clean lines, a minimal exterior and all the natural light you could hope for. The pent roof works great with this streamlined aesthetic. Whatever your preference, we have options to match a roof to your unique style. How about you put a nature-inspired twist on your pent roof? A sedum roof means your garden building will host an abundance of colourful flowering plants. This contrast between nature and contemporary architecture is truly inspiring. Want a stylish and long-lasting garden building that you can truly make your own? Look to Crane Garden Buildings. We can advise you on every specific feature in your garden building, not just the roof! If you’re interested in having a luxury Garden Building designed to your specifications, with delivery and installation included, come visit one of our National Show Centres to see our full range. Our team are on hand to answer any questions you might have. You can Request a Callback, Contact Us, or call us directly on 01760 444 229.